Product prices and availability are accurate as of 2019-04-14 19:17:20 UTC and are subject to change. Any price and availability information displayed on http://www.amazon.com/ at the time of purchase will apply to the purchase of this product. If you are looking to take your art projects into a whole new '3D perspective', then look no further. 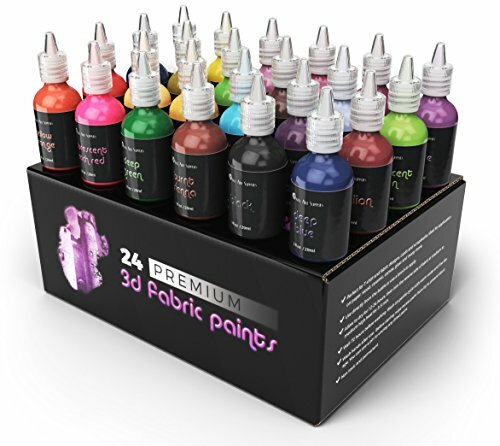 This delightful set of 24 3D puffy paints (including 3 bonus brushes) are sure to become a firm family favorite with an enviable range of bright colors to choose from and a clever, easy-hold bottle design which allows even the youngest of children to participate. Encourage their individuality through creative design and the opportunity to personalise any number of creative projects - whether it's a space theme on a school backpack, silly sock parties or t-shirt design, these 3D fabric paints will make a bold, high-impact design statement for toddlers to teens - and they are so much fun, we think the adults will be getting their hands on these paints too. Use directly from the bottle or use a brush to experiment with special effects. 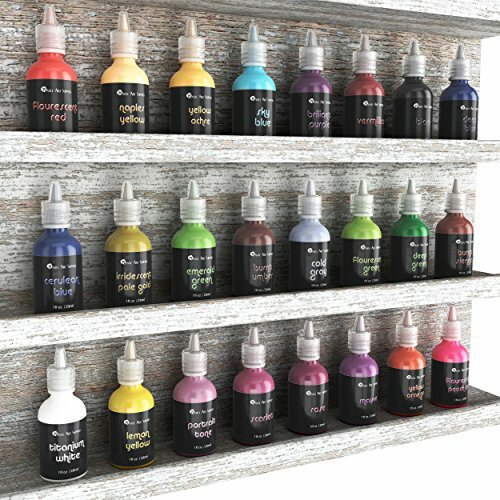 Add your own creative stamp to a multitude of craft paint projects and enjoy incredible results with vibrant, 3D designs that literally stand out. Perfect for themed birthday parties, family gatherings, school and after-school clubs. You could even create your own team sports kit. 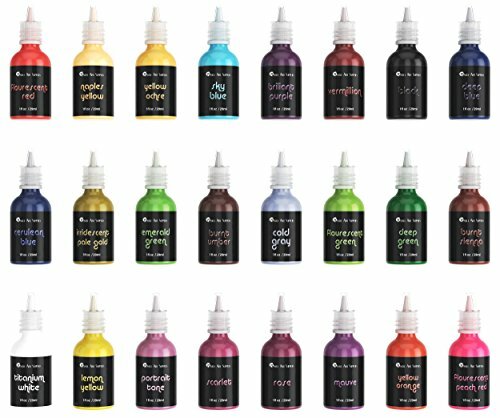 The non-toxic, permanent puffy paints are designed to last - simply design, dry and follow supplied instructions to seal. Be unique...and personalise to your hearts' desire - order today. BRIGHT, VIBRANT SET OF 24 COLORFUL PUFFY PAINTS that will quite literally bring your art project to life - watch as the 3D paint puffs up to give an exciting and realistic three dimensional effect. VERSATILE AND SO MUCH FUN suitable for a wide range of art activities, including (but not limited to)..t-shirt design, sock decorating, bracelets, back packs and all kinds of fabric paint materials. PLUS they work on wood, glass and many other substrates. 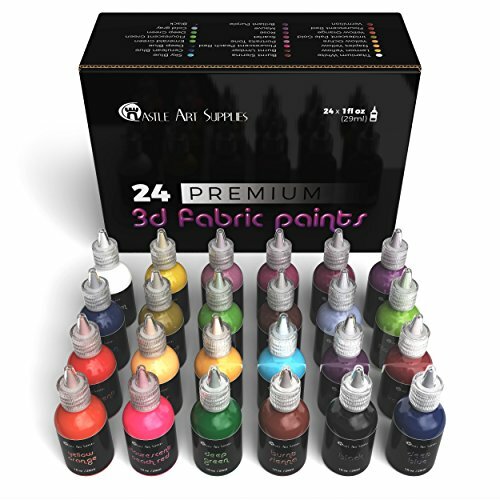 QUICK DRYING, CHILD FRIENDLY 3D PAINTS means these are a craft box essential, ideal for wet weather projects, parties, school assignments and perfect for creating personalised gifts. CUSTOMISE THE PAINT FLOW to create different effects from thin lines to dramatic brushstroke effects, simply snip the special soft-tip to your preferred style and get creative. SET INCLUDES 3 BONUS BRUSHES & 'MONEY BACK GUARANTEE' making this a worry-free, fun-filled, value for money, must have 3D set.